Hi Everybody! Victoria here from Confessions of a New OldHome Owner, back again with another re-purposing / up-cycle project. 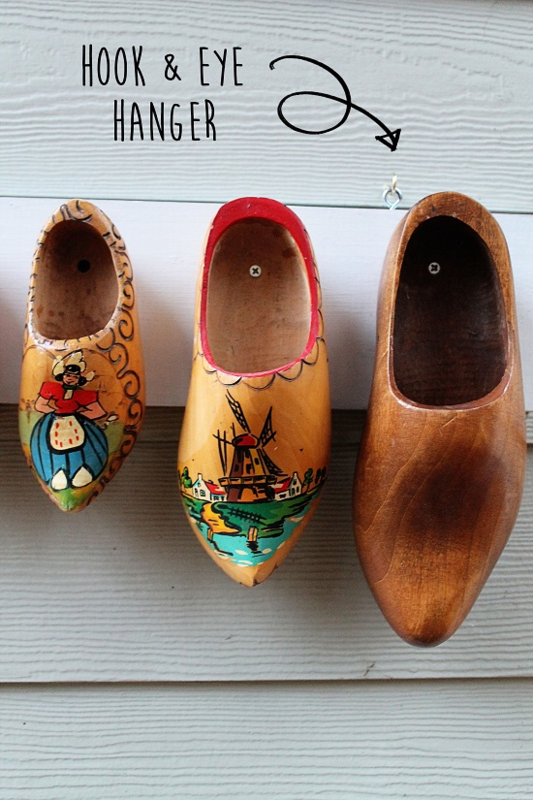 For a while now I have been collecting these wooden Dutch shoes from Holland. I’ve bought them from thrift stores and yard sales for never more than a dollar or two and some for even as little as a quarter. I actually have the pair that my great grandmother used to wear as a little girl when she lived in Sweden, and some of them are really quite colorful. Needless to say I think they are pretty cool and deserve some sort of display of honor. So I gathered my little stockpile and set to work. I really wanted to create a centerpiece that was colorful and set the tone for how I wanted the rest of the porch to look since that's where this piece would be going. You don't have to make your planter quite as large as mine-- if you want one half the size cut it down to your desired length, but generally speaking here’s what you will need. Start by painting your wooden back board, I chose white because the siding on my home is white but you can paint it any color you desire. While it's drying coat each shoe inside and out with a few coats of Thompson's water sealant. Once it's all dry measure and mark where you want each shoe to sit. I started my arrangement from the center and worked my way out but again you can personalize the arrangement to your own taste. 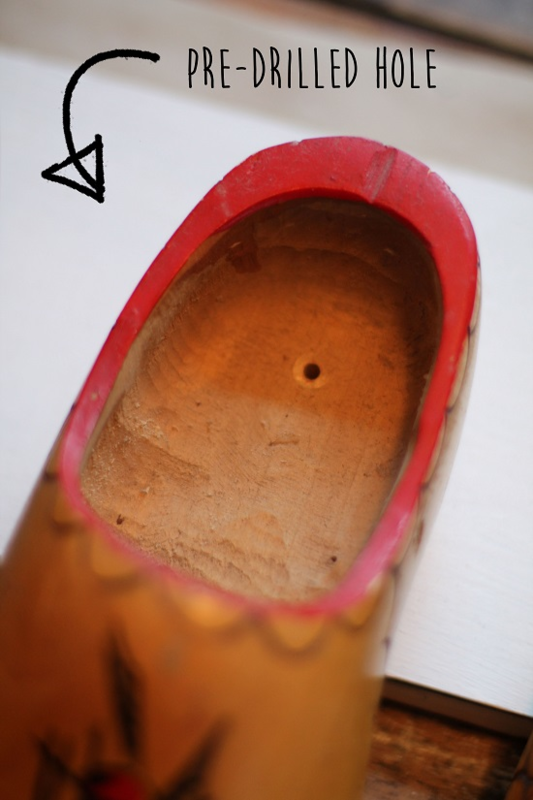 Next pre-drill the holes where they will be attached to the board, once finished drill two or three 1/4" holes into the toe of the shoe. This will allow the excess water to drain out of the shoe, keeping your plants from getting root rot. Screw each shoe into place with a sturdy wood screw. Install your hook and eye hangers at the end of each piece where they will hang from your chosen spot. 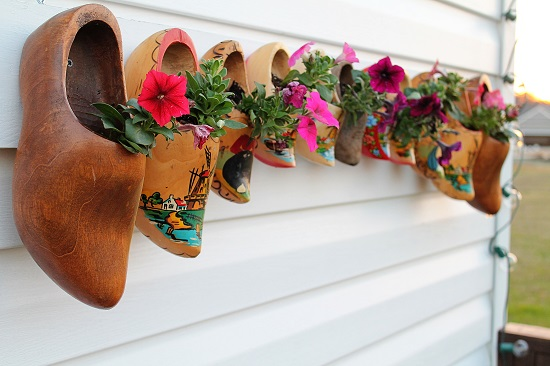 Finish by planting your plants in each shoe and enjoy the view. Needless to say I am so in love with this piece now. 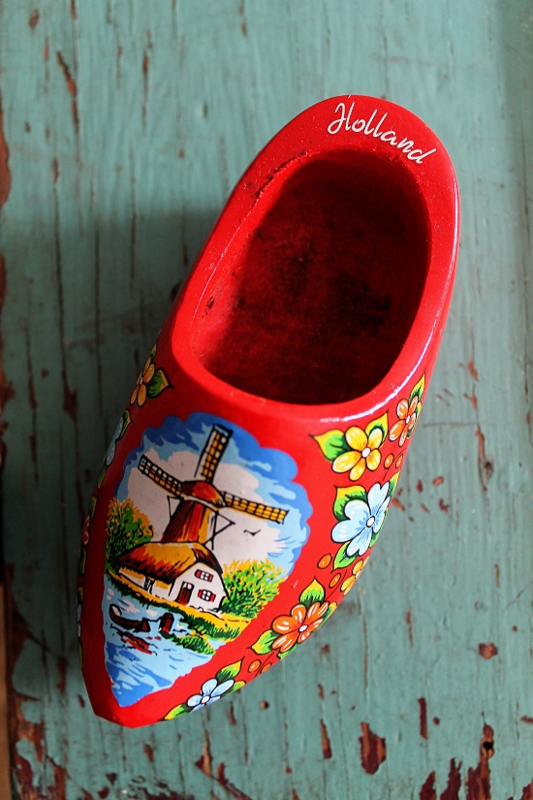 I literally started with a pile of wooden shoes not really knowing where I was headed with it all and ended up with a really cool conversation piece. Until next time! i LOVE this idea!!!! for some reason i can't pin the image though?  i want to pin it but it wn't pop up- just the logo. Hmm....I'm not sure why that is. Maybe how I set them up in Flickr? Could you try it again and let me know if it works now? I LOVE this!!! So charming!!! 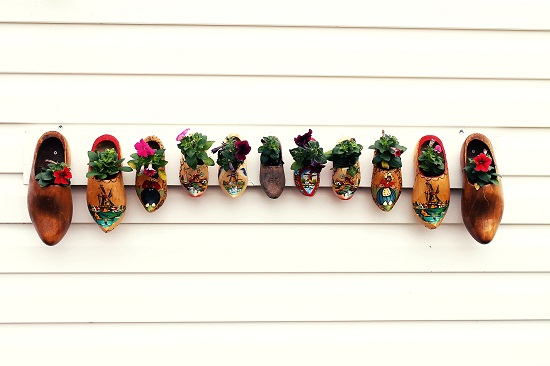 I LOVE this idea for myself - but really this project has my mom written all over it - I think I'm going to try to track down some clogs and make this with her on Mother's Day. So unique!! That's such a great idea! Be sure to send photos when your done-- I love seeing finished projects! That reminds me of a photo that I took on my last trip to the Netherlands. (I've gone there every year for 10 years). 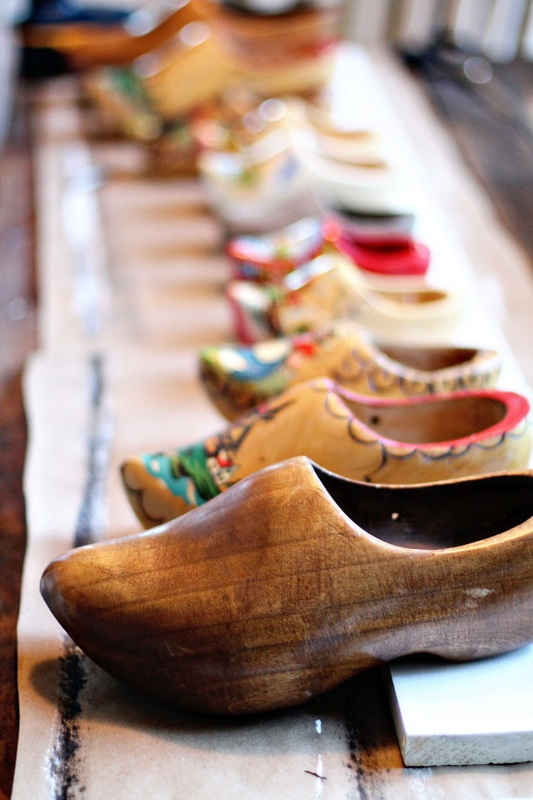 A family had their colorful wooden shoes propped up against the exterior front wall their cottage. So quaint and cute. This was a very creative way to use your shoes.